Photograph and text 2008 by Jacqueline Banerjee. See below for commentary, and moues over the text for links. The original building on this site was designed by James Lewis, the hospital surveyor for the old Bethlehem Royal Hospital at Moorfields. However, his design was based on prize-winning plans submitted by other architects, the best of which were by John Gandy (later known as John Deering). The asylum was completed in 1815, but soon proved inadequate. After the initial transfer of 122 patients, blocks were added in the very next year for the criminally insane. The building was greatly enlarged by Sydney Smirke from 1835 onwards. Smirke provided wings on either side (since demolished) and galleried blocks at the rear; he also enlarged the original low cupola into a tall copper-covered dome, mainly, it seems, to help extend the space in the chapel beneath it. Smirke is sometimes said to have added the imposing portico as well (e.g., see Weinreb and Hibbert 62); but Gandy had proposed a "pediment supported by six Doric columns" (Darlington): it is the type of structure to be seen at University College London, for which he also submitted plans, and on which he worked with William Wilkins. 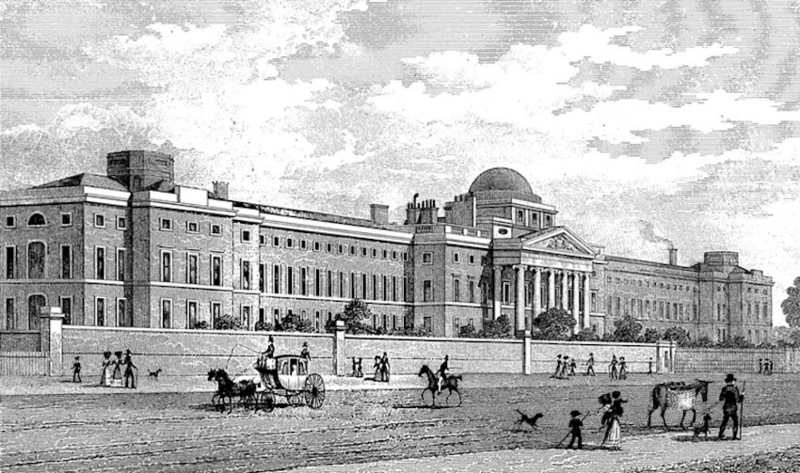 The portico can be seen in Thomas Shepherd's drawing of the Royal Bethlehem Hospital in 1828, as shown in the steel engraving below, long before Smirke started work on the building. J. Tingle's steel engraving of 1828, of Thomas H. Shepherd's original drawing, available on Wikipedia and in the public domain. Sadly, A.W. N. Pugin, who designed St George's Roman Catholic Cathedral diagonally opposite the hospital building, was confined here for a while in 1852 — though he was later moved, and died at home in Ramsgate later that year. Another unfortunate inmate was the painter Richard Dadd. 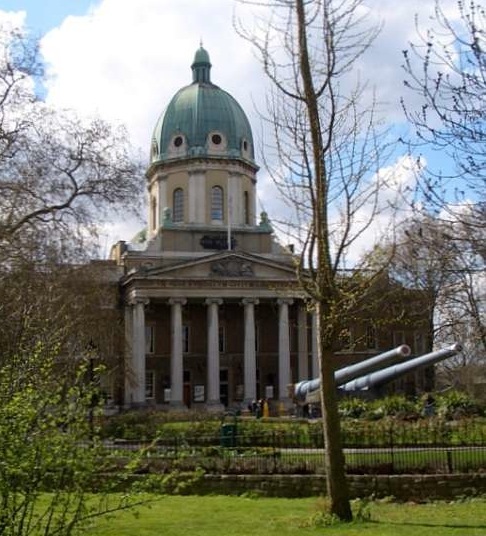 The central portion of the front, with the dome looking disproportionately high above it, and the rear galleries were leased to the Commissioners of Works to house the Imperial War Museum. The building, which was opened to the public in 1936, was damaged considerably by bombs in 1940, 1941, and 1944, but by 1946 was sufficiently repaired for the museum to be re-opened. It is perhaps appropriate that a building occupied for so many years by men and women of unsound mind should now be used to house exhibits of that major insanity of our own time, war. Sadly again, the comment on the building's appropriateness for its present purpose is still timely. Darlington, Ida, ed. "Bethlem Hospital, Now the Imperial War Museum, in Lambeth Road." Survey of London, Vol. 25. Viewed 15 May 2008. Wedgwood, Alexandra. "Pugin, Augustus Welby Northmore (1812-1852)." Oxford Dictionary of National Biography. Online ed. Viewed 14 May 2008. Weinreb, Ben and Christopher Hibbert, eds. The London Encyclopaedia. London: Macmillan, rev. ed. 1992.